Since the Second World War, the Royal Marines have developed a specific function as a commando and amphibious force, undertaking operations in harsh environments from mountain to jungle, cold weather to desert. The Royal Marines is an elite fighting force and is well-known and respected around the world. It is considered to have one of the hardest infantry training programmes and earning the coveted green beret is no easy feat and it demands a transformation that will push an individual to their limits both mentally and physically. It will probably be the hardest thing an individual will ever do but also the most rewarding. This article will provide an overview of the structure of the Royal Marines and organisational changes in terms of manpower. The article will then provide a general outline of the recruitment and selection process (i.e. how to join the Royal Marines) by looking at areas such as eligibility, fitness standards, minimum qualifications, and tests and interviews. Finally, the article will look at funding streams and provide some useful links. On 08 July 2016, the MOD announced that all Ground Close Combat Roles (RAC, Infantry, Royal Marines and the RAF Regiment) would be opened to women by 2018 (British Army, 2016). 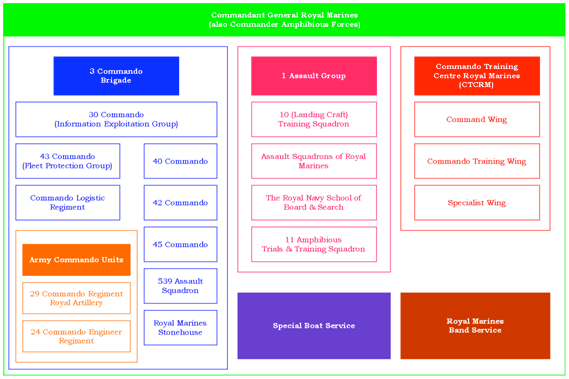 The Royal Marines is made up of a number of units and establishments which are highlighted in figure 1 below. The Royal Marines with the Royal Navy combine to form the Royal Naval Service. The Royal Marines is made up of both Commissioned Officers and Other Ranks (known as Marines). The MoD calculates the numbers that need to be enlisted to maintain the Royal Marines manning levels. The MoD takes account of changing unit establishments, wastage caused by servicemen and women leaving the Royal Marines at the end of their engagements, and those who might choose to leave before their engagements come to an end (PVR or Premature Voluntary Release). The number required in each trade in the Royal Marines is assessed and figures are published at six monthly intervals so that adjustments may be made during the year. Traditionally, the Royal Marines has met these recruiting targets. With this in mind, the full time trained strength of the Royal Marines was 6,890 at 01 November 2013, divided as 730 Officers and 6,040 Marines (DASA, 2013a). The latest figures suggest that the Royal Marines require approximately 500-550 new personnel each year (DASA, 2013a). Trained regular outflows to civil life during the 12 months ending 30 September 2013 included 70 Officers and 620 Other Ranks (3% and 6% of trained regular strength respectively). Within the UK individuals tend to be attracted to individual service branches rather than the military per se. Each Service has their own identity, ethos, core values and standards and people tend to join the Army, Navy or Air Force. This is reflected in the way that each service branch conducts separate recruitment and marketing campaigns. Each has its own strap-line (e.g., the Royal Marines is “It’s A State of Mind”). Selection is conducted separately for each of the Services, but the selection processes are similar in nature. All three Services have different selection procedures for Officers and Other Ranks. However, all include interviews, aptitude and ability testing and some personality measures. There is a filtering system that will select people at the initial application stage, while others will be invited to attend an assessment centre which can last up to three days. As well as technical ability, individuals will be assessed on their general qualities to be a member of the UK military. In addition, preliminary medical examinations will also be carried out including checks on weight, eyesight and hearing, and individuals will need to pass a physical fitness assessment. Table 1, below, provides an outline of the current Royal Marines recruitment and selection process. Friends and family of current and ex-military personnel. Age: there is a minimum and maximum age limit for the Royal Marines. Fitness Standards: all applicants are required to complete the Royal Marines Pre Joining Fitness Test. Minimum Qualifications: roles for Marines do not require minimum qualifications. However, Officers are required to achieve a higher academic standard. With 27 specialisations for Marines and 8 specialisations for Officers, there is a lot to choose from. Medical: there are various criteria including height, weight, eyesight, and checks medical conditions and any ongoing illnesses. Nationality & Residency: Individuals are required to fulfil a number of nationality and residency criteria. Documents required include passport, birth certificate and educational qualifications. Gender: Jobs in the Royal Marines are only open to male applicants. However, females can join the Royal Marines Band Service. Criminal Convictions: some kinds of offences and sentences can bar recruits from joining or rejoining. Tattoos & Piercings: these are dependent on location and nature and will usually need to be declared and shown during a medical examination. When Can an Individual Join? Individuals must be a minimum of 16 years old on entry to initial training, although individuals can apply from 15 years and 9 months. Older individuals must be in initial training before their 33rd birthday. If an individual is under 18 years of age, they will need consent from their parent or guardian before they can progress their application at the Careers Office. If an individual is currently under a care order then the Royal Marines will have to seek permission of the local authority in order for an individual to join. Direct officer entrants must be aged between 17 and 26 years old on the first day of the month they enter the Commando Training Centre Royal Marines (CTCRM). Due to the nature of military training and operations it is critical that individuals get in the best possible shape in order to help them excel during pre-joining fitness tests, initial training and throughout their military career. The Royal Marines has put together training programmes designed to help individuals get their fitness levels to what they should be and increase their chance of success. For the Royal Marines Pre Joining Fitness Test, an individual will have to complete two 2.4km runs (1.5 miles) each with the treadmill set at a 2% incline. To pass an individual will need to do the first run in less than 12 minutes 30 seconds. Then complete the second 2.4km run immediately afterwards in less than 10 minutes; regardless of the individual’s age. There are no minimum qualifications needed. Officer require 180 UCAS points and five GCSEs (A* to C) or Scottish Standard grades or the equivalent, which must include English and maths. The Royal Marines consider people with other qualifications on an individual basis. If individuals start as a direct entry officer, they will need a degree or equivalent, 180 UCAS points and five GCSEs (A* to C), or Scottish Standard grades or equivalent, which must include English and maths. Life in the Royal Marines can be mentally and physically challenging. This is the reason why some medical conditions and ongoing illnesses can stop an individual from joining. As such a full medical examination is part of the application process. It is worth checking the list on the Royal Marines website. Medical Standards: these include everything from respiratory problems such as asthma to musculoskeletal conditions such as joint operations or recurrent back pain, heart and cardiovascular disorders (i.e. high blood pressure). Skin disorders such as eczema or active acne may also be a barrier to service with the Royal Marines. Eyesight Standards: The minimum standards for uncorrected and corrected vision vary for different jobs in the Royal Navy and Royal Marines and are determined by Royal Navy medical staff. If an individual has impaired colour perception (colour blindness) this may restrict the branches that are available. Weight Standard: The minimum weight for RM applicants is currently set at 65 kg. Initially, in 2006, a lower limit of 60 kg was established following a review of the Potential Royal Marines Course (PRMC) and Potential Officers Course (POC) by the Institute of Naval Medicine (INM). It was found that the pass rates for these courses showed a correlation with a body weight of 60 kg or more, therefore it was recommended and subsequently adopted that a minimum body weight of 60 kg be introduced at the selection phase. Subsequently, studies by the Surgeon General’s office identified low body mass and poor aerobic fitness at the start of training, and low energy intake during training as being associated with a reduced chance of successfully completing training, as well as an increased risk of injury during training. These studies identified that a body weight of less than 65 kg at the commencement of training was associated with an increased risk of stress fracture during training, as a result of which the minimum body weight of recruits was raised from 60 kg to 65 kg in September 2011. Height Standard: There is no ‘maximum’ height specified for entry into the RM, although the minimum is 1.51 cm (4 ft 11 in). Body Mass Index (BMI): Height and weight are measured independently of an individual’s BMI and the 65 kg minimum weight for applicants must be achieved irrespective of calculated BMI, which has to fall within the permitted range of 18 and 28 inclusive for applicants over the age of 18 years. http://www.freebmicalculator.net/. BMI Categories: Underweight = <18.5; Normal weight = 18.5–24.9; Overweight = 25–29.9; and Obesity = BMI of 30 or greater. The Armed Forces Weight Management Policy, ‘DIN 2009DIN01-181‘: remains the extant policy document governing UK armed forces weight management policy. The Armed Forces Weight Management Policy, 2009DIN01-181, which came into force on 01 October 2009, provides the policy for the measurement of body composition and the management of Service personnel who demonstrate increased risk of ill health and inadequate physical fitness owing to their weight. The policy requires each Service to provide annual body composition measurement (BCM) for all personnel, in order to identify an individual’s level of health risk and encourage maintenance of a healthy body weight. However, it is concerned with managing the weight and fitness of personnel already serving in the UK military, and does not establish the height and weight criteria for entry into the Royal Marines or the other Services. Individuals must have Indefinite Leave to Remain in the UK or have resided in the UK for five years before they can start an application to join the British Army. Individuals must not have been out of the UK for a continuous period of more than 180 days (6 months) during this five year period. The RT will test an individual’s specific academic ability and how you do on the RT demonstrates your ability to cope with the technical and academic aspects of the Royal Marine training. Although an individual may already have academic qualifications, the RT gives the Royal Marines more information and is considered a fair way of assessing all candidates on a level playing field. There are four separate parts of the test which will need to complete during a strict time limit. These will measure an individual’s: general reasoning; verbal ability; numeracy; and mechanical comprehension. Computer-based skills test: used to assess maths and English abilities. First physical test: 3-mile run in two parts. 1.5 miles as a group in 12 minutes 30 seconds. Then another 1.5 miles in less than 10 minutes 30 seconds. Gym tests: beep test with a target of level 13; two minutes of maximal press-ups; two minutes of maximal sit-ups; and eight overhand grasp pull-ups. Interview: with course Corporal or course officer. Confidence Test & Assault Course: this is carried out in all weather conditions and individuals will be outside and active for over two hours. This is your opportunity to show your determination and stamina. High Obstacle Course: this involves climbing ladders, moving across ropes and negotiating obstacles up to 30 feet off the ground. There is also a timed run around the obstacle course. Endurance Course: this is the last physical test. It lasts about 90 minutes and covers over 2.5 miles of cross-country ground in Woodbury Common (four miles from CTCRM). You will tackle tunnels and water obstacles – which includes the ‘sheep dip’ (submerged tunnel) before going on a run through country lanes. The endurance course will test your dedication. Individuals are expected to keep going while staying positive, despite being wet, cold and tired. Night Out: you will spend the night out under canvas experiencing a side of recruit life that is less about fitness to become a Commando soldier. You will work alone and as a team to prepare food and shelter and look after yourself and your equipment. In the morning you will run back to camp (about 3.5 miles) as a group. Essay: individuals will write a short essay, in one hour, on a current affairs topic that the Royal Marines will provide. The Royal Marines are looking for an individual’s knowledge of defence-related issues, an ability to reason, justify arguments and communicate them clearly in writing. Presentation: individuals will deliver a three minute presentation on a topic of their own choosing given to course members without using any visual aids. This allows the Royal Marines to assess how confidently individuals can give their views to a small audience. Discussion Exercise: individuals will take part in a group debate on a few controversial and topical issues, which will enable the Royal Marines to see how well an individual can formulate ideas and put forward their point of view when tired. The Royal Marines will see how individuals listen to others and react to them, particularly when they disagree with you. If an individual is currently in year 11 or 12, they can apply for a sixth form scholarship. This, currently, provides £1050 a year, plus a chance to experience life as a Royal Marine, for example, as the guest of officers in the wardroom. Whether an individual is hoping to go to university, or if they are there already, they can apply for a standard bursary, currently, worth £1500 a year. Individuals stay a civilian while studying, but spend part of their holiday getting to know the Royal Marines and preparing for their future career. In October 2011 the Royal Marines (2011) published ‘The Royal Marines Vision: Think Commando’ in response to the Strategic Defence and Security Review published in 2010. The document mainly reiterates the prominent role of the Royal Marines and does not mention any minor or major restructuring other than continued geographical consolidation of forces in the South West of England. A very thorough document ‘Informed Choice? Armed Forces Recruitment Practice in the United Kingdom’ written by David Gee in 2007 and available from: http://www.informedchoice.org.uk/informedchoice/informedchoiceweb.pdf. DASA (Defence Analytical and Statistics Agency) (2013a) Naval Service Monthly Personnel Situation Report: 1 November 2013. Available from World Wide Web: http://www.dasa.mod.uk/publications/personnel/military/navy-monthly-situation-report/2013-11-01/1-november-2013.pdf. [Accessed: 07 January, 2014]. DASA (Defence Analytical and Statistics Agency) (2013b) Naval Service Quarterly Pocket Brief: October 2013. Available from World Wide Web: http://www.dasa.mod.uk/publications/personnel/military/navy-quarterly-pocket-brief/2013-10-01/1-october-2013-revised.pdf. [Accessed: 04 January, 2014]. Gee, D. (2007) Informed Choice? Armed Forces Recruitment Practice in the United Kingdom. Available from World Wide Web: http://www.informedchoice.org.uk/informedchoice/informedchoiceweb.pdf. [Accessed: 04 January, 2014]. Royal Marines (2011) The Royal Marines Vision: Think Commando. Available from World Wide Web: http://www.royalnavy.mod.uk/About-the-Royal-Navy/~/media/Files/Navy-PDFs/About-the-Royal-Navy/Royal%20Marines%20Vision.pdf. [Accessed: 07 January, 2014]. British Army (2016) Ground Close Combat Roles Open To Women. Available from World Wide Web: http://www.army.mod.uk/news/28632.aspx. [Accessed: 08 August, 2016]. Land navigation/map reading in the military is, in general, an important skill. The impact of dyslexia on an individual’s ability to map read would depend on the severity of their dyslexia. Plus you also need to think your current level of land navigation/map reading skill! When were the height and weight restrictions introduced and why ? Prior to 01 April 2011 the minimum weight standard for the Royal Marines attending the PRMC was 60kg, after this date it was raised to 65kg. The minimum weight of 65kg upon entry is regardless of height, which continues to be 1.51cm (4ft 11in). However, individuals still need to be within the Body Mass Index (BMI) thresholds: http://www.freebmicalculator.net/. BMI Categories: Underweight = <18.5; Normal weight = 18.5–24.9; Overweight = 25–29.9; and Obesity = BMI of 30 or greater. The Armed Forces Weight Management Policy, 2009DIN01-181, which came into force on 01 October 2009, provides the policy for the measurement of body composition and the management of Service personnel who demonstrate increased risk of ill health and inadequate physical fitness owing to their weight. The policy requires each Service to provide annual body composition measurement (BCM) for all personnel, in order to identify an individual's level of health risk and encourage maintenance of a healthy body weight. I can now give you a fuller answer to your question. Look at the Medical Assessment section of the page.